How to Create Content to Drive Traffic to Your eCommerce Site - Dynamic Enterprise Technologies, Inc. Improving your website’s content to increase traffic and revenue to your site may seem challenging. How do you even begin to create this content and as a retailer, how do you track what pages have really improved as a result of your optimization work? This blog post is about content creation it is part one of a two part post. The second part will discuss tracking. Tracking your website’s performance will provide you with the data necessary to evaluate and optimize your work. Creating unique and interesting content will become your subject to measure. So let’s dive into content creation! A great technique to help you create useful content is to play a word game. Begin with one word (ideally a category keyword) and throw out ideas that come to mind when you think of that word. 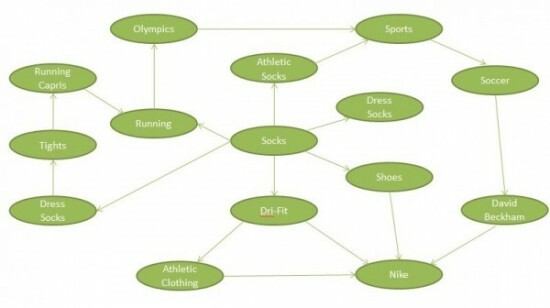 You can begin to map those ideas similarly to the image below. You can see that there are areas that lead to a dead end like ‘Nike’ (a very popular athletic brand) but you will also find areas that would be worth building out further. In this case there is a strong relationship between socks and sports. Begin to think about articles now, or just continue expanding the word game a bit. You will begin to find additional topics that relate to your product and could make great articles. Make a list of all the topics you think would be interesting for your customers and website visitors. At this point you can start to expand a main category focus into a larger, but still relevant content campaign. Think back to the Word Game with the category “socks”. Within that category we created a variety of thoughts that somehow linked back to socks. 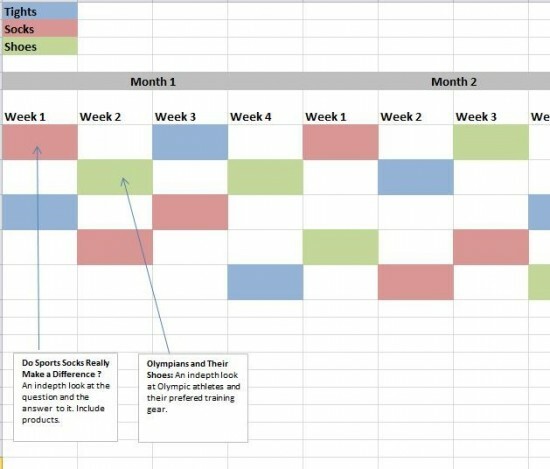 Using those thoughts, add a text block within Excel and build the article titles into each of the content blocks. Next add a little bit of content next to each title to remind you what the article will be about. Once published, the article titles will allow you to start tracking your target keywords and assist you in improving your keyword list depending on the traffic response you receive. If you get stuck while writing, try playing the Word Game again, as this will help you create additional ideas within the subtopic. Use the content you create to optimize your company blog, expand your category pages and create topics within your store and even product pages if you can. Your store is set up so that you can place content within your store’s pages very easily. If you choose to create your content in a Word Document (recommended for editing and saving) always copy and paste your content into notepad before you place it on your site. This will remove any formatting that has occurred. Topics: Information on how to manage topics can be found here. Paste your content from notepad directly into the page editor. Select save and you can now view you page by going to www.store.com/t-name-of-topic.aspx. Product & Category Pages: Similar to topics, you can add content to your category and product pages by pasting and copying from notepad. In either categories or individual products you will want to paste the content directly into the “description” field/tab. The goal with creating all of this content is to generate new ideas, identify new keywords and expand from the ordinary plain content that currently exists. Don’t forget to think about your brand when creating content. You don’t want to overdo it by adding too much branding but you will want to engage your readers with some of it. Remember this is also an opportunity to present your company as the “experts” in the industry. Search Engines (Google and Bing) love fresh, unique and informative content. The more you create and deliver, the more traffic you will see. Remember instant website success doesn’t happen overnight but continued hard work and regular content creation will pay off over time. You will begin to see your site rank higher and for those keywords you have spent months trying to get.